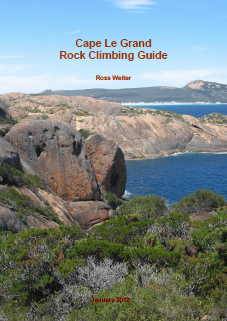 Ross Weiter has written a new mini-guide for Cape Le Grande near Esperance. It has been posted to the Miniguides and Cape Le Grande pages. Thanks go to Ross for his continued dedication to producing quality mini-guides. As far as grades go i don’t believe L’esperance is 18 … I climbed it with 5 others who have climbed around the world and we all thought 16 was about right. Its still a fine route, but if thats an 18 then Flying Kiwis is a 20 (which it isn’t , its 18). Roaring forties is an 18, not 19, or else you’ll have to increase the grade of There she blows which is solid 19 (especially if you finish direct to the top as per the original route description). My hunch is that Verlaine encroaches on this route and has dulled the challenge of what was a fairy sporty but safe and exciting runout to the top? As I relayed in my comments on this site, and emails to you, the missing bolts on Wheres my cyclone are explained, the only drill bit I had busted .. its a bit disappointing to read your comment about the missing bolts in the guide. As you know I had offered to provide bolts and hangers to anyone able to get down there and complete the bolting. So the offer still stands if anyones heading that way drop me an email and I’ll get you the gear. Its a classic and deserves to be completed otherwise as I mentioned earlier pre clip the lowest bolt from abseil and its still pretty staunch. Hopefully I will make it down there again this summer and tidy it up. Nameless is a great route, 23 if finished direct (with the 23 move being the last one) or sustained 21 if you do as I did and clip the last bolt and make a rising traverse to the notch on the right. John Miller also lead this variation. Its also worth stressing that rapping Kiwi wall is 28m, so rapping off a 50m rope doubled could land you in a world of hurt. Rob was lucky to escape injury when he abseiled off the ends of his ropes on our first trip there. but it is important when publishing guides that the grades at a given crag are as consistent as possible. In other words the grade 18’s, or 20’s at a crag should be very similar in terms of difficulty. Good on you for placing the sling, I’m 92kg and have snapped a bunch of flakes off these walls , including some on the start of family affair. Kangaroo rock is primarily a well equipped sport crag and in that context a dubious sling over a fragile and dodgy flake seems a bit weird. Did you have a go at WMC? I thought it was quite staunch so be interested in your opinion. Previous PostPrevious CAWA is now on Facebook !! !